Beyond sewage spills, something else is getting into our springs, rivers, and wells, nitrates from fertilizer, maybe livestock, wildlife, domestic pets, or septic tanks. We want to know when, where, and what, so maybe we can do something about it. And when there is a spill, the testing required by the permits is very limited, so we want to follow up spills and find out how far they went and what they affected. So WWALS has started a Water Quality Testing Program. Sign up to do water quality testing. We held Florida water quality testing training noon, Monday, January 21, 2019, at Suwannee River State Park. We will be scheduling another Florida training. The next Georgia water quality training will 2PM, Saturday, April 27, 2019, at Reed Bingham State Park, after the BIG Little River Paddle Race. 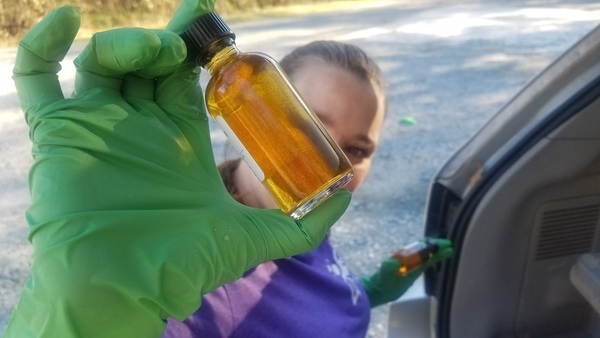 A recent Georgia Training, Water Quality Testing, Pictures 2018-09-16. We have collected quite a bit of background water quality test data from Georgia, from Tifton, Lowndes County, and Valdosta. Bacteria levels all dropped 2018-12-12. WWALS files a Georgia Open Records Act (GORA) request weekly with Valdosta, and usually gets back on Friday Valdosta’s river testing data from the preceding Wednesday. Here are the recent weeks of that data, in the format they sent and visible below. Yes, we have suggested to Valdosta that they could put their spreadsheet online just as easily as we can. Much of that quality data, along with spill reports, is in this this map in Water Reporter. Eventually we hope to put much of it into Georgia Adopt-A-Stream; there’s some further training to do first.